Rust is one of the worst challenges when it comes to clean it from different items, such as garden tools, pipes, and other metal objects. It is very hard to get rid of it without spending a lot of money on cleaning products, which are also very toxic. 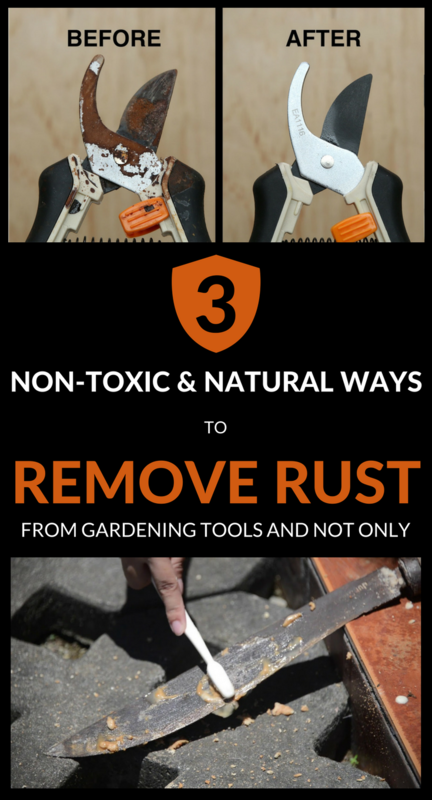 But you didn’t know that rust can be easily removed with some common, almost ordinary tricks. Shall I mention that the products worth a penny? Baking soda is e real magic powder when it comes to rust. All you have to do is to boil a cup of water. In a small bowl, add baking soda and pour with small drops hot water, stirring well until you get a very thin paste. Apply the paste obtained in the rusted place. Let it work for 10-15 minutes, then rub it well with an abrasive sponge or old toothbrush. At the end, rinse well with warm water. A simple way to get rid of rust is using potatoes. Cut a potato in half, and moisten the cut half in dish detergent. Then rub the rusted place with the potato. Repeat as often as needed. When the rust is gone, rinse well with warm water. Another trick, very handy and non-toxic is cleaning the rust with salt and lemon. Apply a generous salt layer to the rust area, and then “spray” the area with lemon juice. Let the salt to soften and act over the rusted area for 2 hours, then rub the place with the lemon peel. Rinse with abundant water.